With the modern business and technology used in today world SAP has introduced diverse portfolios of cloud solution with innovative and current application for smooth and efficient running of your business. Offering a customized solution for your business needs SAP Cloud solution has all what you need. Without establishing local or personal hardware and software and relying on shared pool of physical resources is known as cloud computing. With automatic control on the resources as per necessity cloud computing ensure to have supply and demand should be at par or balanced. Cloud hosting is a type of service wherein customer can utilize as per requirement for their website and are charged as per their consumption. This service offer hosting for websites with the help of virtual servers which evaluate resources from physical web servers. Cloud hosting can be used as a alternative and can be considered as an extension to clustered hosting where websites are hosted on diverse servers. Cloud hosting can offer various benefits and feature like physical security, Scalability, flexibility, responsive. A private cloud is having a secured and different cloud based environment which offer specific cloud to operate. The accessibility is undertaken by a single organization offering control and privacy to great extent. From technical aspects it is hard to explain what constitute a private cloud. With benefit of higher security and privacy ensures operations to keep operation out of the reach. Private cloud enables to have more control achieving tailored solutions for network. Apart from this private cloud offer benefits like cost and energy efficiency, improved reliability and cloud bursting. Having a access over public network like internet public cloud is one of the most recognized network by consumers built in to shared physical resources. With one shared infrastructure public cloud offers services to various clients which is one of the basic advantage of public cloud. As the name implies public the services are offered to public and to operate effectively a public cloud makes a significant role. Basic feature and benefits of public cloud is it is having ultimate scalability, cost effective, utility style costing, reliability, flexibility and location independence. Utilizing both public and private cloud hybrid cloud is integrated performing different functions. Every cloud services offer different efficiencies however one of the most cost effective and scalable services are provided by public cloud as compared to private cloud. In an organization for non sensitive operation public cloud can play an important role maximizing efficiencies. With a private cloud a enterprise can host their ecommerce website because of its security and scalability. However for brochure public cloud can be used as it is more cost effective. Using hybrid can have numerous benefits and features like scalability, flexibility, security, cost effectiveness. Cloud servers function in a different way however their working is same like physical servers. Renting virtual serve space is what is offered is Cloud server is opted instead of purchasing physical servers. Two types of hosting are usually offered shared and dedicated hosting. One of the cheapest hosting is shared hosting wherein multiple clients share the same hosting serve which belong to other websites. With certain limitation it cannot cope up with huge traffic and is inflexible. Cloud hosting is flexible as it is more cost effective and you can reduce or increase the resources accordingly. Basic benefits of cloud hosting are it is very easy to setup, reliability and infused with scalability, flexibility. LaaS is one of the fundamental service module wherein forming a virtual surrounding and providing access to computing resources. Cloud provider is responsible for maintaining servers and networks across many data centers. laaS can be widely used by enterprises to bring down the cost and offer easy scalable solution to IT sector managing the expenses of hardware which are outsourced to the cloud provider. It provides a unique feature of integrating hardware themselves rather than installing and purchasing them. The basic features of laaS are cloud hosting, scalability, cost effectiveness, security of data and location independence. One of the cloud computing platforms is PaaS which offer a created environment for developers to construct application and services over internet. You can simply access it through a browser and it can be hosted by a cloud. PaaS enable to offer preconfigured features which customer can subscribe to and software can be created by the tools supplied by the provider. With a managed mechanism it helps developers to frame original ideas of creating application through testing. 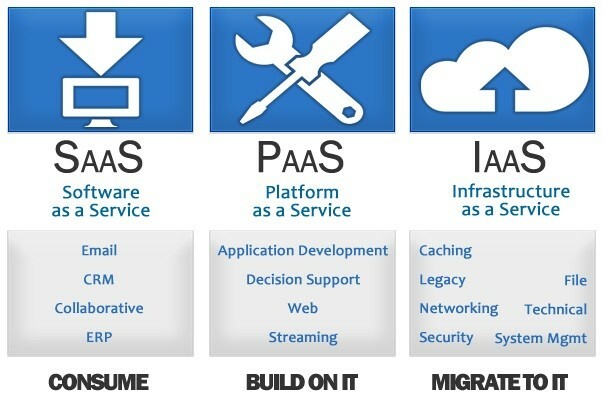 Basic features of PaaS are it is secured, flexible, easily adapted, easy development for non experts and simple to use. Accessing software application over internet with any cloud services constitute SaaS. Infused with a wide range of task for individual and organization application can be hosted in the cloud. Some renowned examples of SaaS are facebook, twitter, google wherein individual can have access to these applications through internet. On enterprises level it offers a wide range of planning, monitoring, tracking and communicating. With no additional hardware cost is one of the basic advantages of SaaS. There are numerous other benefits of SaaS which includes easy accessibility, automatically updating, no initial cost and customized application.